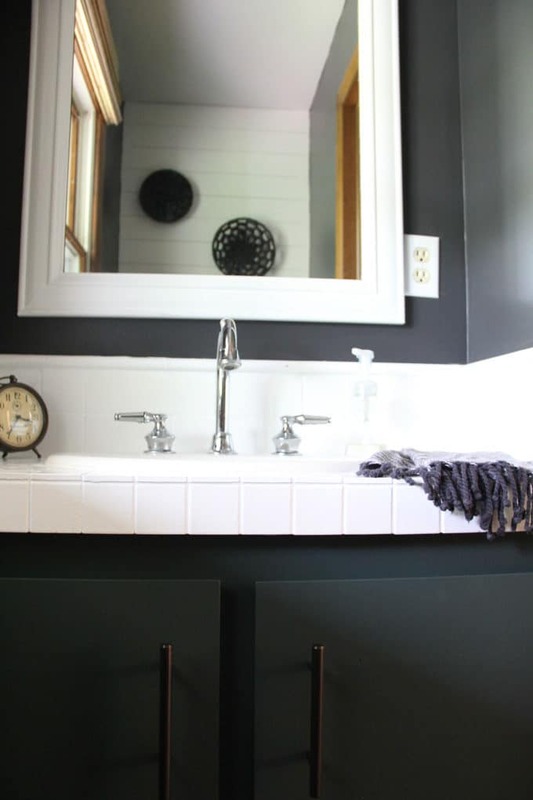 Today I’m so excited to reveal our powder bathroom that I just finished updating. Miraculously I was able to update it for under $100! 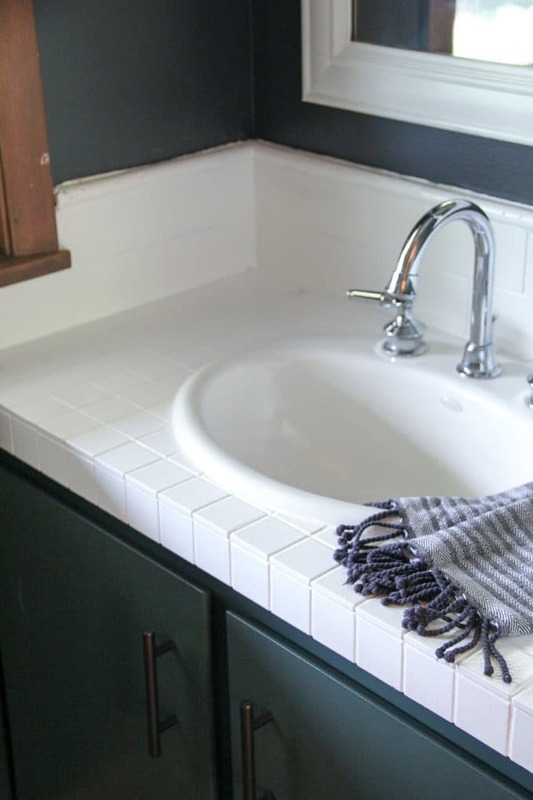 I’ll walk through how I was able to transform this bathroom so cheaply! 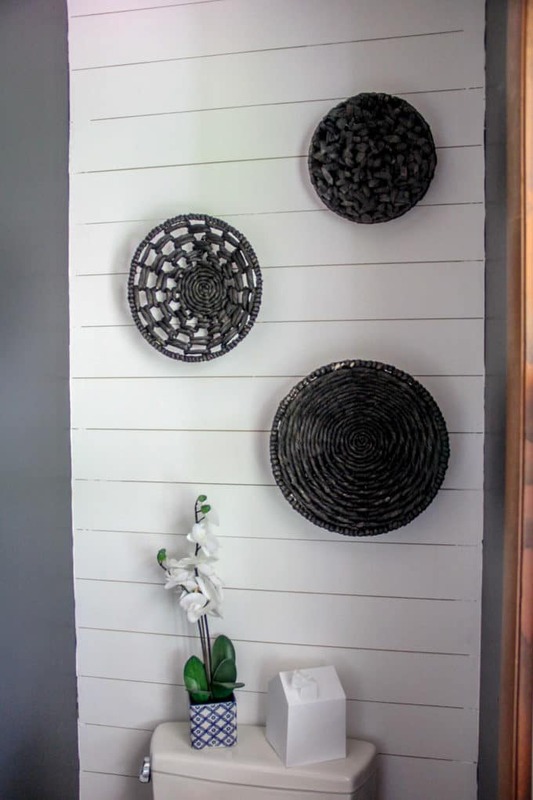 Earlier this week I shared our faux shiplap wall behind the toilet. The entire vanity situation in this room was really bad. When we moved into the house the bathroom had this tiny mirror with dated sconces on the side of it. Early on I had replaced it with a bigger mirror that I found on clearance at Lowe’s for only $17! 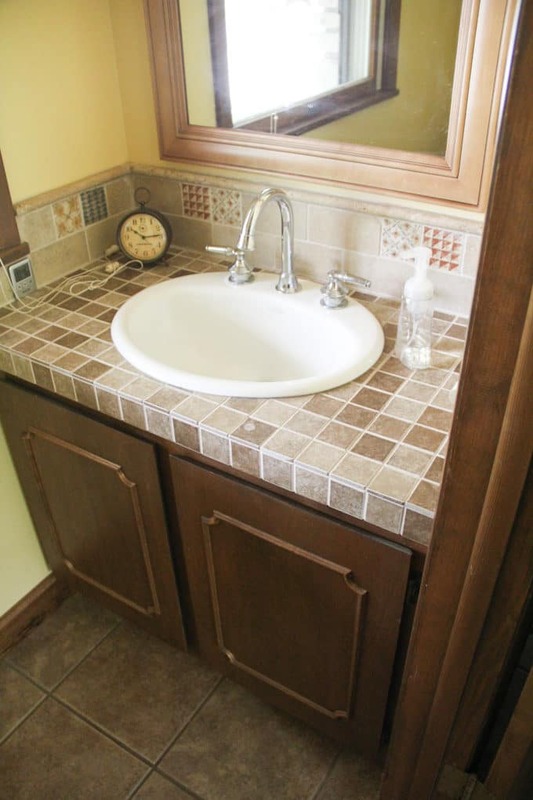 Even though the new mirror helped I still hated the brown tile vanity. 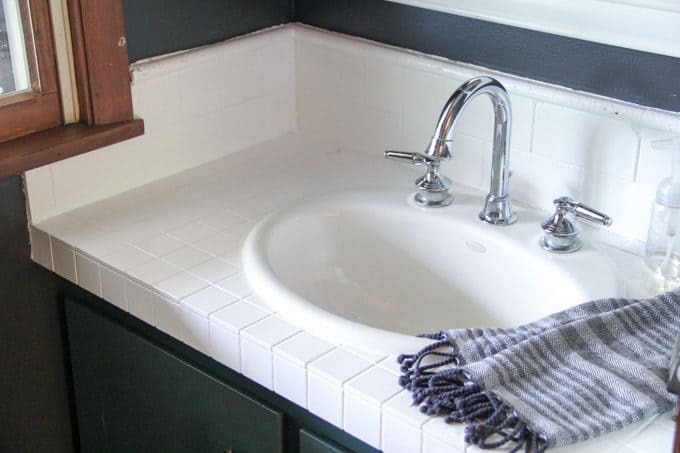 I started by taping everything off the sink and wall, then I used three coats of Rustoleum tub and tile paint to cover the surface. 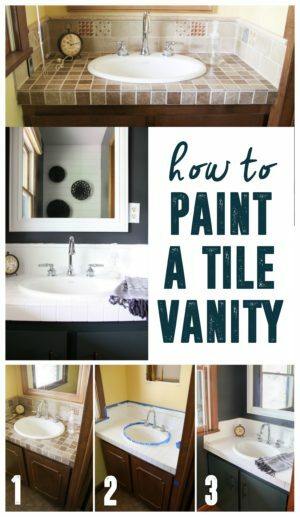 Thankfully I had plenty of extra from when I painted our backsplash, so I hit the vanity at the same time. To paint it I used a brush and rolled everywhere that I could. Now that it is bright, clean and white I like it SO much more. 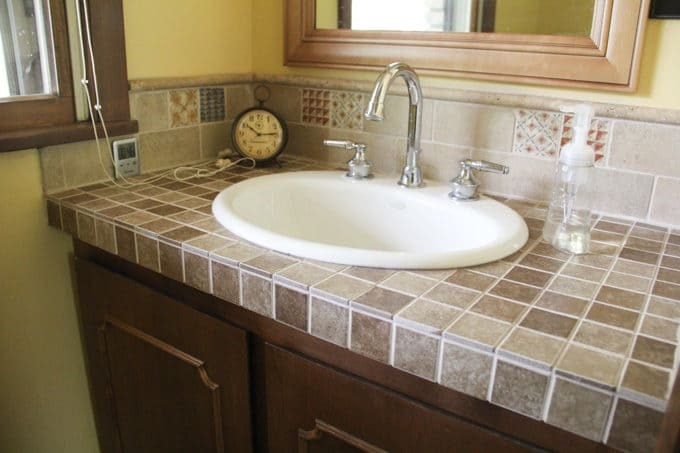 A serious transformation from the prior brown and patterned tile huh?! Next I painted the cabinet with Benjamin Moore “Hidden Falls”, which I had leftover from painting our faux shiplap closet doors. 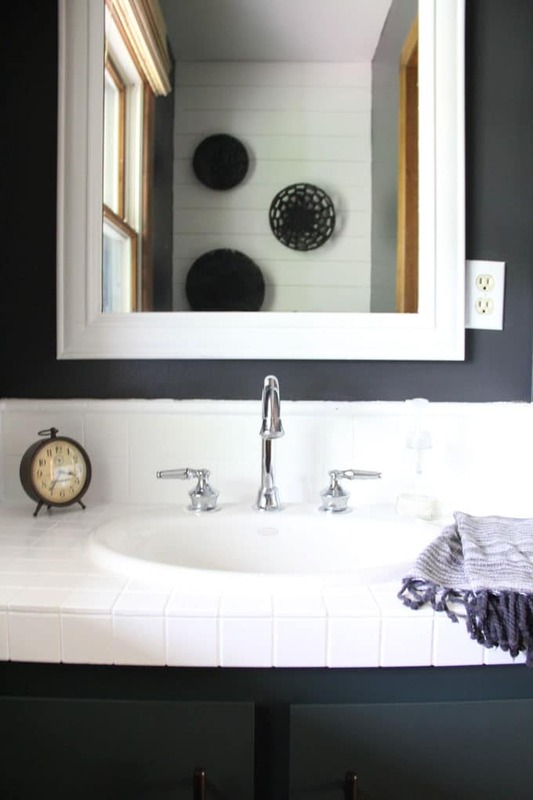 I also painted the mirror with a coat of white paint. 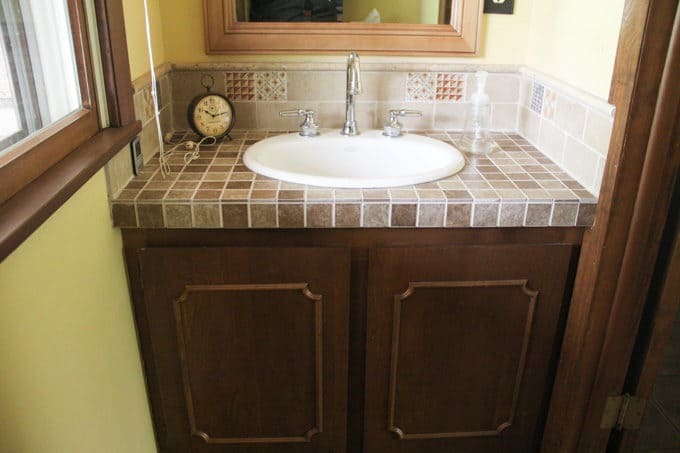 To help modernize the vanity I pried off the wood design on the face, and added the leftover pulls from removing a few kitchen cabinets. 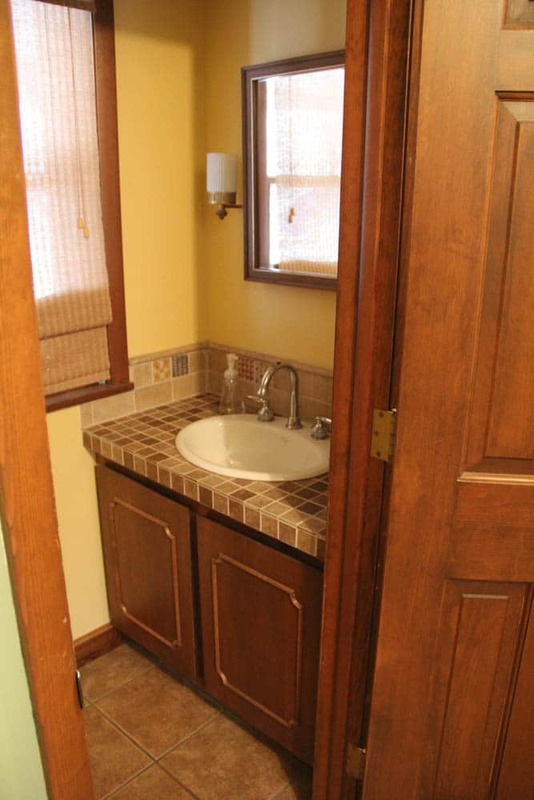 Here was the “before” view of the vanity. Now here is the after! A pretty dramatic transformation huh?! 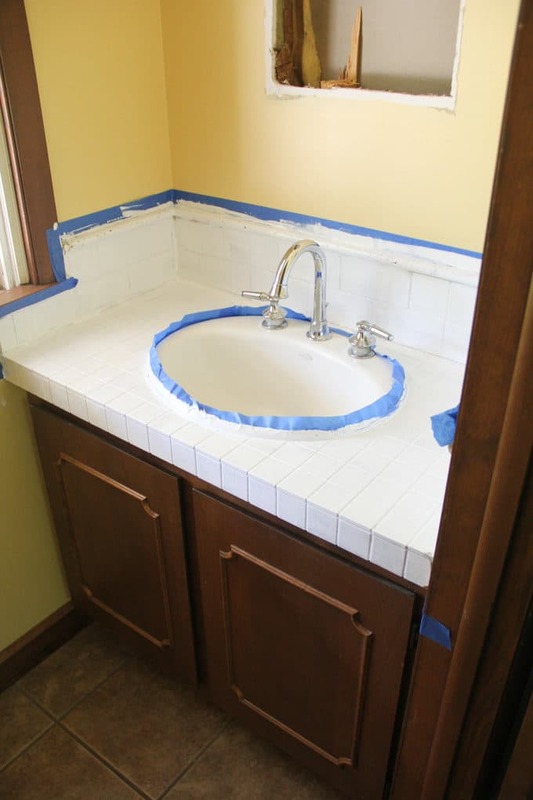 If I wouldn’t have had the Cabinet Handles, tile paint, white paint, and plywood strips on hand it would have brought the total up about$75 more. 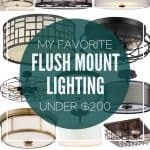 If you’ve got a bathroom that you hate, I hope this post encourages you that it doesn’t take an entire bathroom overhaul to bring it up to date! 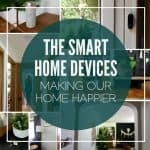 For under $200 you can give it a facelift! 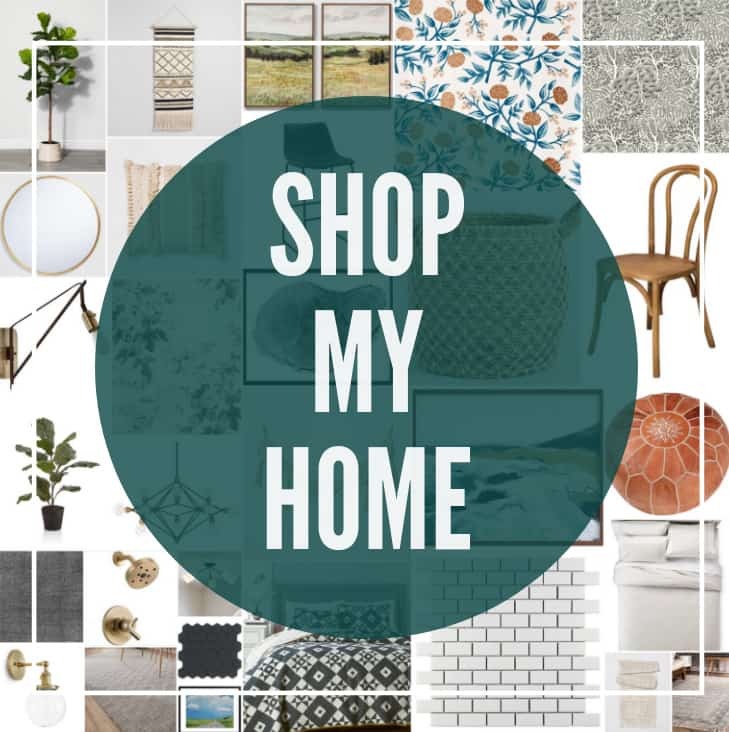 Thanks for stopping by to checkout how to remodel a bathroom on a budget. You nailed it out of the ballpark. 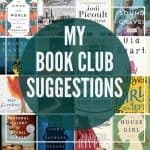 Thanks for the wonderful tips. Thank you so much for your sweet sweet comment! It’s so nice to hear from someone who loves it as much as I do! 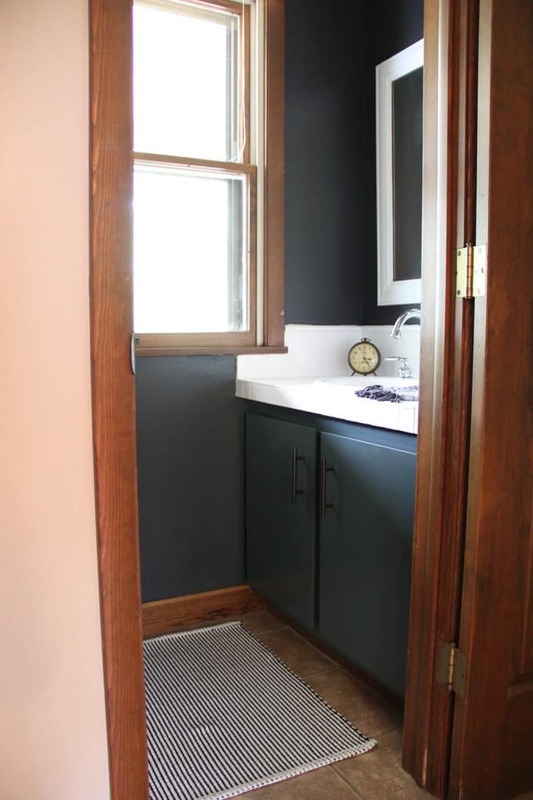 What kind of paint did you use on tile. Was it oil based ? I dont want it to peel or lift off . 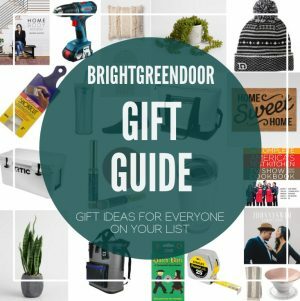 Do I need to sand it down a bit so it wont “slip”? 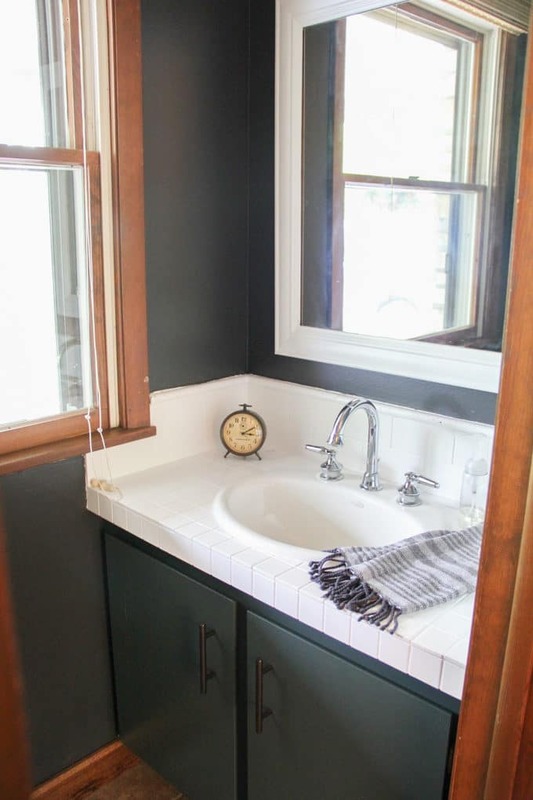 It’s rustoleum tub and tile paint. It is an oil based product, here is the affiliate link to it: https://amzn.to/2CCTicN. I didn’t sand ours down, but they weren’t super shiny to start with.